Fat Acceptance is a social movement, that promotes changing cultural attitudes, towards overweight and obese people. Other names for fat acceptance is fat liberation, fat power, big is beautiful, and health at every size. Advocates of fat acceptance want to change the collective bias about overweight people. They believe that health is independent of body weight. In February 2016, fashion model, Cheryl Tiegs was criticized, and subsequently apologized, for her comments about Sports Illustrated full-figure cover model Ashley Graham, who at 5’9″, weighs 182 pounds. Tiegs quoted Dr. Oz, that being over-sized isn’t healthy in the long run. Excess weight causes a break down in joint cartilage, causing pain, swelling, and problems moving the joint. Cartilage provides cushioning between the bones. In osteoarthritis, bone rubs against bone, creating joint damage and more pain. Being only 10 pounds overweight increases the force on the knee by 30-60 pounds with each step. Overweight women have nearly 4 times the risk of knee osteoarthritis. For overweight men, the risk is 5 times greater. Even small amounts of weight loss reduces the risk of developing knee osteoarthritis. A person who is 100 pounds overweight, puts 400 extra pounds of pressure on their knees. The more weight on your joints, the greater the chances of cartilage breakdown, and premature damage to the knees, hips and lumbar spine. What Is A Pelvic Tilt Exercise? The pelvic tilt is an easy core exercise that stretches low back muscles. The exercise can be performed seated, standing, or lying on your back. When Should You Do The Pelvic Tilt Exercise? Pregnant women benefit from pelvic tilting because it prevents prenatal low back ache. People who experience low back pain, caused by muscular tightness, will find that pelvic tilting, along with strengthening the abs, and back, will help alleviate low back discomfort The pelvic tilt is also used by Pilates teachers, physical therapists, and personal trainers, who help their clients improve posture. Exercise Ball. If you don’t have an exercise ball, use a sturdy chair. Sit on an exercise ball, with your knees at right angles. Your feet should be hip width apart, and touch the floor. Be sure you feel stable before beginning the exercise. If you can’t stabilize your body on the exercise ball, use a sturdy chair instead. Move slowly throughout the movement, as you tilt your low back, and then sit up tall. 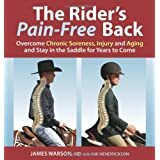 The Rider’s Pain Free Back, by James Warson, M.D. published in 2007 by Trafalgar Square Books. Dr. Warson gives a thorough explanation of the causes, prevention, and remedies of back pain, for riders of all disciplines. Science-based explanations are written so that everyone can understand, and appreciate the congenital and mechanical reasons for developing lumbar pain. Dr. Warson’s book provides practical information on the diagnosis, treatment, and pain management related to back problems in riders. If you’re a rider who has given up, or is thinking of giving up riding because of a sore, or painful back, this book is a must read. Dr. Warson, a lifelong horseman, and neurosurgeon is the founder of the Front Range Brain and Spine Surgery Center in northern Colorado. The Rider’s Pain-Free Back is sold on Amazon, where it rates a 5 star review from readers.